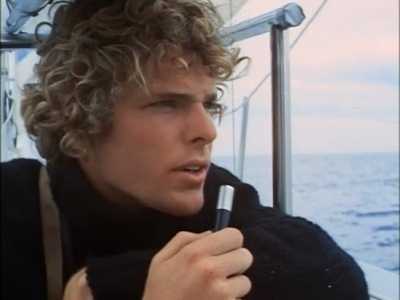 THE DOVE——-Robin Lee Graham set out to sail around the World, alone, at age 16. It took him five years, tacking his 24-foot boat 32,786 miles. Gregory Peck was so taken with Graham’s odyssey that he produced this eye-filling but flawed valentine, enlisting the talents of Sven Nykist (camera) and John Barry (baton) to bring the adventure off the page and into theaters. 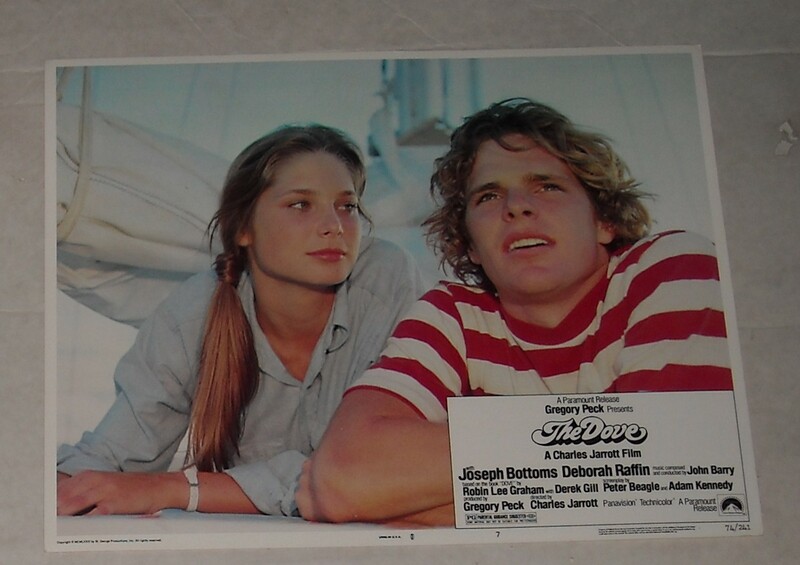 Taking a gamble, eschewing star-power, Peck picked newcomers Joseph Bottoms and Deborah Raffin as Graham and his girlfriend/wife, Patty. A trim budget of $2,100,000 was allotted. A few reliable character actors did small roles—John Anderson, Dabney Coleman, John McLiam—but the real hook was location filming in many of the locales Graham visited during his quest. Like any big trip then, it’s a mixed bag, and watching it with a critical, engaged and forgiving eye depends a lot on the temperament of the traveler…er…viewer. To start–it’s a nice movie: there’s no horrible stuff, blood & guts or in-yer-face ‘reality’. It’s rather sweet, really. For many, it will be too sweet, since the young actors are—while photogenic as heck, and earnest—not quite deep enough to pull off many of the moments required by the pedestrian script. Much of the ker-thud factor goes to director Charles Jarrott, who seems to do a lot of “one-take-okay-kids-that’s-great” shooting, and there is also some fault in the sound department, as it’s obvious a lot of the dialog was looped. The camera puts you there, then the sound takes you out of the moment and reminds you that these are two kids who need coaching. On the trip, Graham/Bottoms is almost run over by a tanker, loses two pets (one is a cat that gets eaten by a shark—and you will actually be glad when this happens), falls in love, argues with his father, survives storms, and basically goes bonkers after a long period of isolation. Raffin, aside from being cute as hell, could run like a friggin’ demon–rarely have you seen an actress look so impressive in a display of actual physical prowess. Sadly, Raffin, a fresh and fit 21 during filming, passed away from leukemia in 2012, only 59. What saves the movie—and for me, as a self-styled wanderer, its a Big save—is the great location work. There are NO process studio shots, so we get copious eyefuls of—hang on, wistful ones—-Fiji, Australia, Madagascar, Mozambique, South Africa, Panama and the Galapagos. Window-shopping these distant, intoxicating, exotic locales from back in 1974 is more than enough to make up for some of the more gauche dabs of human drama that fairly echo “cut!—um, lets try that again”. It really is a ‘nice’ little movie.